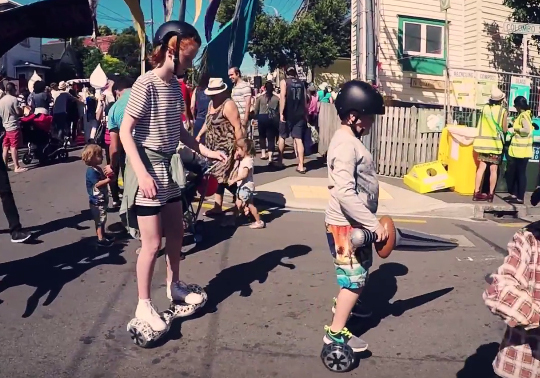 We’re Ghost, a Wellington tech sports brand bringing electric self-balancing boards to New Zealand. But that’s not all we’re doing. Ghost and our team of ambassadors (known as the #ghostcrew) are pioneering the overlap between sports and tech – encouraging our riders to build skills on electronic vehicles and compete in future tech sport competitions. Our boards retail for $799 and are the safest ones on the market. They are controlled by the rider’s feet, using platforms with built-in gyroscope sensors. Tech specs vary from brand to brand, so we’ll just go over the stats you can expect from Ghost Boards. It takes around three hours to fully charge the 36V Samsung lithium-ion battery, which will give you around 20 kilometres of mileage (or 3 hours). The board can carry a rider weighing up to 120 kilograms, yet weighs just a smidgen over 10 kilograms itself. With a zero turning radius, you can manoeuvre through narrow places with ease (and do 360-degree turns on the spot until you get dizzy). You can get up to 10 kilometres per hour on a Ghost Board and climb 20-degree hills, which makes them pretty awesome for Wellington. All Ghost Boards meet New Zealand and Australian safety standards. They are CE, FCC, C-TICK, and RoHS certified; and come with a one-year warranty. Like what you’re hearing? You can check us out on our website at www.ghostboards.co, Facebook at gh0stboards, Instagram at @ghostboards_, Twitter @ghostboards, or follow us on Snapchat (we’re GhostGetsSnappy).